교육용으로 개발한 Portable 수압파쇄 (Hydrofrac) 장비를 구입하시려면 우담개발로 전화나 E-mail 주십시오. The in situ state of stress in the earth’s crust has been widely recognized as a basic parameter necessary in the engineering design of underground openings. Quantitative evaluation of horizontal in situ stresses in rock at a specific site cannot be made since gravitational forces are practically the only one clearly understood. Therefore, these horizontal stresses require direct measurements in the field. Presently the most common method of measuring in situ stress from near-surface to considerable depths is hydraulic fracturing (or hydrofrac). Typically hydraulic fracturing is conducted in vertical boreholes. A short segment of the hole is sealed off using an straddle packer. This is followed by the pressurization of the fracture-free segment of the hole by pumping in water. The pressure is raised until the rock surrounding the hole fails in tension at a critical pressure. Following breakdown, the shut-in pressure, the lowest test-interval pressure at which the hydrofrac closes completely under the action of the stress acting normal to the hydrofrac. In a vertical test hole the hydrofrac is expected to be vertical and perpendicular to the minimum horizontal stress. An impression impression packer or borehole logging devices can be used to obtain the orientation of the hydrofrac which yields the direction of the maximum horizontal stress. The magnitudes and directions of in situ stresses around the investigation site provide the crucial design parameters: initial stress conditions around the prospective site; orientation of the drift; depth of the opening; stability analysis of the opening. The major downhole instruments involved in hydraulic fracturing in situ stress measurement method are: Straddle packer system for fracture initiation and extension, Impression- orienting system for fracture delineation. A tripod and a wireline hoist replace the conventional drill rig and drill pipes. Using wireline fast and continuous tool tripping is possible without tool retrieval to the surface after each test. 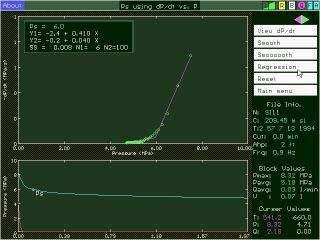 A laptop PC-based Analog-to-Digital converter records and stores pressure-flowrate-time data reliably. The wireline system allows the user to measure the in situ state of stress near the future underground opening more affordably by improving its cost-effectiveness through the use of a wireline in place of the conventional drill-pipe method. A PC-based interactive data acquisition and analysis software package minimizes uncertainties in recording and analyzing hydrofrac data. The analysis package is based on the statistical routines (Lee and Haimson, 1988, 1991) developed for identifying key test parameters: shut-in pressure, fracture reopening pressure, dip and dip direction of hydrofracture. ASTM Designation D4645-87, Standard test method for determination of the in-situ stress in rock using the hydraulic fracturing method, Annual Book of ASTM Standards, 4.08, 851-856 (1989). Aamodt R. and M. Kuriyagawa, Measurement of Instantaneous Shut-in Pressure in Crystalline Rock, in Hydraulic Fracturing Stress Measurements, National Academy Press, Washington, D. C., 28-43 (1983). Abou-Sayed, A. S., C. E. Brechtel and R. J. Clifton, In Situ Stress Determination by Hydrofracturing: A Fracture Mechanics Approach, J. Geophys. Res., 83, 2851-2862 (1978). Ahagen, H., Instruments for Hydrogeological and Geochemical Measurements in Deep Boreholes, International Symposium on Field Measurements in Geomechanics, Zurich, 1289-1292, (1983). Baumgartner, J. and F. Rummel, Experience with Hydraulic Fracturing as a Stress Measuring Technique in Jointed Rock Mass, in Proc. 2nd International Workshop on Hydraulic Fracturing Stress Measurements, University of Wisconsin-Madison, pp. 168-204, (1988). Baumgartner, J., F. Rummel, B. C. Haimson, and M. Y. Lee, In Situ Stress Measurements and Natural Fracture Logging in Drill Hole CY-4, the Troodos ophiolite, Cyprus, In Cyprus Crustal Study Project, Initial Report, Hole CY-4, Geological Survey of Canada, paper 88-9, pp. 315-330 (1989). Biot, M. A, General Theory of Three-dimensional Consolida-tion. J. Appl. Phys. 12, 155-164 (1941). Biot, M. A. and Willis, D.G., The Elastic Coefficients of the Theory of Consolidation, J. Applied Mechanics, 594, (1957). Bjarnason, B, C. Ljunggren, and O. Stephansson, New Developments in Hydraulic Fracturing Stress Measurements at Lulea University of Technology, Int. J. Rock Mech. Min. Sci. & Geomech. Abstr., 26, 579-586 (1989). Bradley, W. B., Failure of Inclined Boreholes. J. Energy Res. Tech., Trans. AIME, 102, 232-239 (1979). Bredehoeft, J., R. Wolff, W. Keys, and E. Shuter, Hydraulic Fracturing to Determine the Regional In-situ Stress Field, Piceance Basin, Colorado, Geol. Soc. America Bull., 87, 250-258 (1976). Cheung, L. S. and B. C. Haimson, Laboratory Study of Hydraulic Fracturing Pressure Data-How Valid Is Their Conventional Interpretation?, Int. J. Rock Mech. Min. Sci. & Geomech. Abstr., 26, 595-604 (1989). Cheung, L.S., Laboratory Simulated Hydraulic Fracturing Stress Measurements in Intact and Prefractured Rocks, Ph.D. thesis, University of Wisconsin-Madison (1990). Clark, J. B., A Hydraulic Process for Increasing the Productivity of Wells, Trans. AIME, Vol. 186, 1949. Cornet, F. H. and B. Valette, In Situ Stress Determination from Hydraulic Injection Test Data, J. Geophys. Res., 89, 11527-11537 (1984). Cornet F. H., Stress Determination from Hydraulic Tests on Preexisting Fractures- the H.T.P.F. Method. in Proc. Intl. Symp. Rock Stress and Rock Stress Measurements, CENTEK Publ., Lulea, pp. 301-311 (1986). Daneshy, A. A., A Study of Inclined Hydraulic Fractures. Soc. Petr. Engrs. J., 13, 61-68 (1973). De la Cruz, R. V. and C. B. Raleigh, Absolute Stress Measurements at the Rangely Anticline, Northwestern Colorado, Int. J. Rock Mech. Min. Sci. & Geomech. Abstr., 9, 625-634 (1972). Dischler, S. A. and K. Kim, Determination of Rock Deformation Modulus during Hydraulic Fracturing, in Proc. 26th U.S. Symposium on Rock Mechanics, South Dakota School of Mines and Technology, 363-373, (1985). Doe, T.W., W.A. Hustrulid, B. Leijon, K. Ingvald and L. Strindell, Determination of the State of Stress at the Stripa mine, Sweden, in Hydraulic Fracturing Stress Measurements, National Academy Press, Washington, D. C., pp. 119-129 (1983). Enever, J. R. and B. A. Wooltorton, Experience with Hydraulic Fracturing as a Means of Estimating In-Situ Stress in Australian Coal Basin Sediment, in Hydraulic Fracturing Stress Measurements, National Academy Press, Washington, D. C., pp. 28-43, (1983). Enever, J. R. and P. N. Chopra, Experience with Hydraulic Fracture Stress Measurements in Granite, in Proc. International Symposium on Rock Stress and Rock Stress Measurement, CENTEK Publ., Lulea, pp. 411-420 (1986). Evans, K., A Laboratory Study of Two Straddle-Packer Systems under Simulated Hydrofrac Stress-Measurement Conditions, J. Energy Resources Technology, 109, 180-190 (1987). Gronseth J.M. and P. R. Kry, Instantaneous Shut-in Pressure and its Relationship to the Minimum In-situ Stress, in Hydraulic Fracturing Stress Measurements, National Academy Press, Washing-ton, D. C., 55-60 (1983). Haimson, B. C., Earthquake Related Stresses at Rangely, Colorado, in Proc. 14th U.S Rock Mech. Symp., Am. Soc. Civil Engrs, New York, NY, pp. 689-708 (1973). Haimson, B. C., A Simple Method for Estimating In Situ Stresses at Great Depths, In Field Testing and Instrumentation of Rock, ASTM STP 554, American Society for Testing and Materials, pp. 156-182 (1974). Haimson, B. C., Design of Underground Powerhouses and the Importance of Pre-excavation Stress Measurements, in Proc. 16th U.S Rock Mech. Symp., Am. Soc. Civil Engrs, New York, NY, 197-204 (1977). Haimson, B. C., Crustal Stress in the Michigan Basin. J. Geophys. Res. 83, 5857-5863 (1978a). Haimson, B. C., The Hydrofracturing Stress Measuring Method and Recent Results, Int. J. Rock Mech. Min. Sci. & Geomech. Abstr., 15, 167-178 (1978b). Haimson, B. C., Field Measurements and Laboratory Tests for the Design of Energy Storage Caverns, in Proc. 4th ISRM Congress, 2, Balkema, Rotterdam, pp. 195-201 (1979). Haimson, B. C., Near Surface and Deep Hydrofracturing Stress Measurements in the Waterloo Quartzite, Int. J. Rock Mech. Min. Sci. & Geomech. Abstr., 17, 81-88 (1980). Haimson, B. C., Stress Measurements at Hanford, Washington for the Design of a Nuclear Waste Repository Facility, in Proc. 6th Congress of the International Society for Rock Mechanics, Balkema, Rotterdam, pp. 119-123 (1987). Haimson, B. C., Current Hydraulic Fracturing Interpretation, How Correctly Does It Estimate the Maximum Horizontal Crustal Stress?. EOS, Trans. Am. Geophys. U., 69, 1454 (1988). Haimson, B. C. and T. W. Doe, State of Stress, Permeability, and Fractures in the Precambrian Granite of Northern Illinois, J. Geophys. Res., 88, 7355-7371 (1983). Haimson, B. C. and J. N. Edl, Hydraulic Fracturing of Deep Wells, SPE 4061, presented at the 47th annual fall meeting, AIME, Soc. of Petr. Engr. (1972). Haimson, B. C. and C. Fairhurst, Initiation and Extension of Hydraulic Fracture in Rocks, Soc. Petr. Engrs. J., Sept., 310-318 (1967). Haimson, B. C. and X. Huang, Hydraulic Fracturing Breakdown Pressure and In Situ Stress at Great Depth. in Rock at Great Depth (Edited by Maury and Fourmaintraux), Balkema, Rotterdam, pp. 939-946 (1989). Haimson, B. C. and C. F. Lee, Hydrofracturing Stress Determinations at Darlington, Ontario. in Proc. 13th Canadian Rock Mech. Symp., Canadian Inst. Min. Met, Toronto, Ontario, pp. 42-50 (1980). Haimson, B. C. and M. Y. Lee, Development of a Wireline Hydrofra-cturing Technique and Its Use at a Site of Induced Seismicity, in Proc. 25th U.S Rock Mech. Symp., Soc. Mining Engrs, New York, NY, pp. 194-203 (1984). Haimson, B. C. and M. Y. Lee, Stress Measurements at the Jordanelle Dam Site, Central Utah, Using Wireline Hydrofracturing, final report to U.S. Geological Survey, 14-08-0001-21890 (1985). Haimson, B. C. and M. Y. Lee, The State of Stress in a Jointed Rhyolite, in Proc. 28th U.S. Rock Mech. Symp., Rotterdam, Balkema, pp. 231-240 (1987). Haimson, B. C. and B. Voight, Crustal stress in Iceland. Pageoph, 115, 153-190 (1977). Haimson, B. C., M.Y. Lee, N. Feknous, and P. de Courval, "Stress Measurements at the Site of the SM3 Hydroelectric Scheme, Near Sept-Iles, Quebec", Intl. J. Rock Mech. and Mining Sci., vol.33, 487-497, (1996). Haimson, B. C., M. Y. Lee, and N. Chandler, Estimating the State of Stress at the Underground Research Laboratory from Hydraulic Fracturing Tests in Three Holes of Different Plunges, in Rock Mechanics Tools and Techniques, Eds. M. Aubertin, F. Hassani and H. Mitri, Balkema Pub., vol. I, 913-919 (1996). Healy, J. H. and M. D. Zoback, Hydraulic Fracturing In Situ Stress Measurements to 2.1 km Depth at Cajon Pass, California, Geophys. Res. Lett., 15, 1005-1008 (1988). Hickman, S. H. and M. D. Zoback, The Interpretation of Hydraulic Fracturing Pressure-Time Data from In-situ Stress Determination, in Hydraulic Fracturing Stress Measurements, National Academy Press, Washington, D. C., 44-54 (1983). Hubbert, M. K. and D. G. Willis, Mechanics of Hydraulic Fracturing, Trans. AIME, 210, 153-166 (1957). Hudson J. A. and C. Fairhurst, Tensile Strength, Weibull's Theory and a General Statistical Approach to Rock Failure, in Proc. Southampton 1969 Civil Engineering Materials Conference, pp. 901-914 (1969). Kehle, R. O., The Determination of Tectonic Stresses Through Analysis of Hydraulic Well Fracturing. J. Geophys. Res. 69, 259-273 (1964). Lee M. Y. and B. C. Haimson, PC-based Data Acquisition and Analysis Software for Hydraulic Fracturing Stress Measurements, in Field Measurements in Geotechnics, Ed (Sorum), 455-464 (1991). Lee M. Y. and B. C. Haimson, Statistical Evaluation of Hydraulic Fracturing Stress Measurement Parameters, Int. J. Rock Mech. Min. Sci. & Geomech. Abstr., 26, 447-456 (1989). Li, F., Q. Zhai, M. D. Zoback, B. C. Haimson, and M. Y. Lee, Stress Measurement in the Red River Fault Region of Yunnan province, China, EOS, Trans. Am. Geophys. U., 66, 1060 (1985). Ma, M., Hydraulic Conductivity Evaluation of Potential Underground Sites for Housing Superconductive Magnet Using Field and Laboratory Methods, M. S. thesis, University of Wisconsin-Madison (1979). Mardia, L., The Statistics of Orientation Data, Academic Press, London (1972). Muskat, M., Use of Data on Build-up of Bottom Hole Pressures, Trans. AIME., 123, 44-48 (1937). Ren, N. K., Experimental Evaluation of Mechanical Anisotropy in the Waterloo Quartzite, M. S. thesis, University of Wisconsin-Madison (1979). Richardson, R. M., Hydraulic Fracture in Arbitrarily Oriented Boreholes: An Analytic Approach, in Hydraulic Frac-turing Stress Measurements, Nation-al Academy Press, Washing-ton, D.C., pp. 167-175 (1983). Rogiers, J. C., C. Fairhurst and R. B. Rosene, The DSP - A New Instrument for Estimation of the In-Situ Stress State at Depth, paper SPE 4246 presented at 6th Conference on Drilling and Rock Mechanics of SPE-AIME, Austin, Texas (1973). Rummel, F., Fracture Mechanics Approach to Hydraulic Fracturing Stress Measurements, in Fracture Mechanics of Rock (Edited by B.K. Atkinson), Academic Press, London, pp. 217-239, (1987). Rummel, F., J. Baumgartner H. J. Alheid, Hydraulic Fracturing Stress Measurements Along the Eastern Boundary of the SW-German Block, in Hydraulic Fracturing Stress Measurements, National Academy Press, Washington, D. C., pp. 3-17 (1983). Rummel, F. and Winter, R. B., Fracture Mechanics as Applied to Hydraulic Fracturing Stress Measurements, Earthq. Predict. Res. 2, 33-45 (1983). Schmitt, D. and M. D. Zoback, Laboratory Tests of the Effects of Pore Pressure on Tensile Failure, in Rock at Great Depth ( Edited by Maury and Fourmaintraux), Balkema, Rotterdam, pp. 883-889 (1989). Sumner, J. S., Geophysical Studies of the Waterloo Range, Wisconsin, Ph.D. thesis, University of Wisconsin-Madison (1956). Tarantola, A. and B. Valette, Generalized Nonlinear Inverse Problem Solved Using the Least Squares Criterion, Rev. Geophys. Space Phys., 20, 219-232 (1982). Terzaghi, K., Theoretical Soil Mechanics, J. Wiley, New York (1943). Thwaites, F.T., Buried Precambrian of Wisconsin, Wisconsin Geological and Natural History Survey Map (1957). Tsukahara, H., Stress Measurements Utilizing the Hydraulic Fracturing Technique in the Kanto-Tokai Area, Japan, in Hydraulic Fracturing Stress Measurements, National Academy Press, Washington, D. C., pp. 18-27 (1983). Tunbridge, L. W., Interpretation of the Shut-In Pressure from the Rate of Pressure Decay, Int. J. Rock Mech. Min. Sci. & Geomech. Abstr., 26, 457-459 (1989). Tunbridge, L. W., C. M. Cooling, and B. C. Haimson, Measurement of Rock Stress Using the Hydraulic Fracturing Method in Cornwall, U.K.-Part I. Field Measurements, Int. J. Rock Mech. Min. Sci. & Geomech. Abstr., 26, 351-360 (1989). Warpinski, N. R., P. Branagan and R. Wilmer, In-Situ Stress Measurements at U.S. DOE's Multiwell Experiment Site, Mesaverde Group, Rifle, Colorado, J. Petr. Tech., 527-536 (1985). Zemanek, J., R. L. Caldwell, E.E. Glenn Jr., S. V. Holcomb, L.J. Norton and A. J. D. Straus, The Borehole Televiewer-A New Logging Concept for Fracture Location and Other Types of Borehole Inspection, J. Petr. Tech., 762-774 (1969). Zoback, M. D. and B. C. Haimson, Status of Hydraulic Fracturing Method for In-situ Stress Measurements, in Issues in Rock Mechan-ics, Proc. 23rd U.S. Symposium on Rock Mechanics, Soc. of Mining Engineers of AIME, New York, pp. 143-156 (1982). Zoback, M. D. and S. H. Hickman, In Situ Study of the Physical Mechanisms Controlling Induced Seismicity at Monticello Reservoir, South Carolina, J. Geophys. Res., 87, 6959-6974 (1982). Zoback, M. D. and D. D. Pollard, Hydraulic Fracture Propagation and the Interpretation of Pressure Time Records for IN-Situ Stress Determination, in Proc. 19th U.S. Rock Mech. Symp., pp. 14-22 (1978). Zoback, M. D., H. Tsukahara and S. Hickman, Stress Measure-ments Near the San Andreas Fault, J. Geophys. Res., 85, 6157-6173 (1980). Zoback, M. L. and M. D. Zoback, State of Stress in the Conterminous United States, J. Geophys. Res., 85, 6113-6156 (1980). Zoback, M. D. and B. C. Haimson, Editors, Hydraulic Fracturing Stress Measurements I National Academy Press, Washington, D.C., 270 p., (1983).